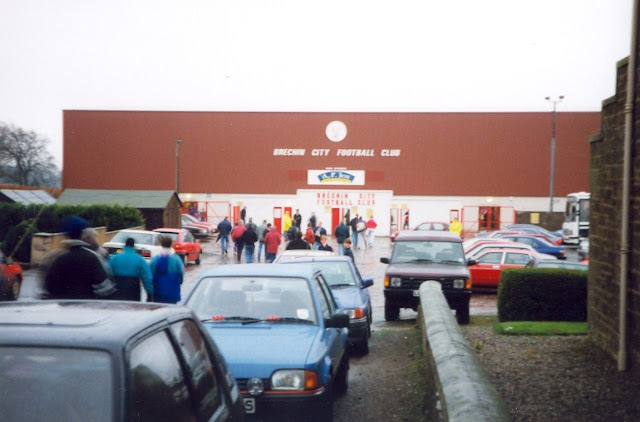 I am fairly sure there have been precious few occasions over the years where Brechin City have gone into a Scottish Cup tie as favourites. However, with the club mining a particularly rich seam of form (just 2 defeats in their previous 21 matches), and visitors Albion Rovers already well on their way to another season of mid-table mediocrity, this was one such instance. That Brechin failed to prevail was in no small way due to a fine display from Rovers' ‘keeper Mark McLean. Indeed, for a spell it looked as if it would be visitors’ name in the hat for the fourth round draw, once David LORIMER had converted a penalty kick after 47 minutes, but Stuart SORBIE’s leveller in the 62nd minute granted City’s players a well earned trip to the fleshpots of Coatbridge. The famous Glebe Park hedge was wearing its winter rainment when I visited and, at the time of writing (2011), is still standing (better than it ever did?). This despite the best efforts of some faceless, beaurocratic, shrubberyphobe at UEFA who had decreed in 2009 that, as Glebe Park failed by three metres to meet the recently instigated minimum required width for a pitch hosting first class football, the hedge had to go to allow the pitch to be widened. Figures of around £10,000 were being bandied around for the cost of the work, but of more concern was the heritage aspect. Glebe Park has always has a hedge – indeed it was there before the football club! After being initially a bit heavy handed over the whole issue UEFA, thankfully, eventually saw a bit of sense and, after some vague mutterings about relaxing the rules for clubs in the lower reaches of the Scottish League, they discretely forgot all about the business. Although played on a nostalgia-inducing Seventies glue-pot of a pitch (including a sandpit in front of the main stand which would have delighted a classroom of toddlers), this was a remarkably entertaining encounter. 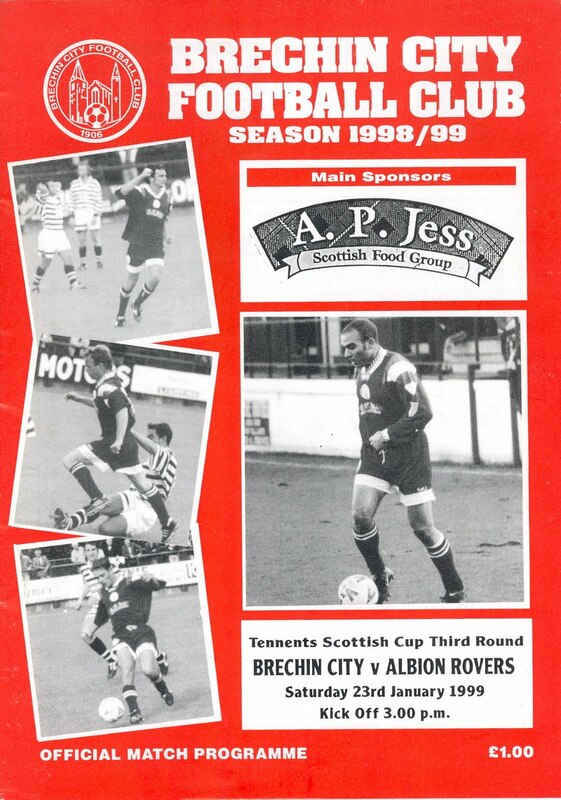 Particularly during the last-half hour of the match, which saw Brechin going hell-for-leather for a win. The home lot had gone one up in the 4th minute, Andy JACKSON capitalising on a defensive error, before Willis FURTADO curled in a delight of an equaliser three minutes later. Frenchman Furtado looked a bit of a player early on, but as the going underfoot got heavier as the match progressed he morphed into The Invisible Man. I was slightly surprised it took until the 89th minute for him to be hooked. Oli SHAW, I believe it was, put the visitors 2-1 up around the 15 minute mark, but I was in the (also Seventies nostalgia-inducing) Gents at the time, so missed that one. 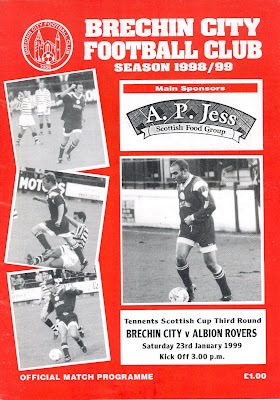 The second half was, after they had equalised through Dougie HILL, pretty much all Brechin (I can recall just one save being required of home 'keeper Graeme Smith), but woeful finishing let them down. On at least three occasions delightfully enticing crosses whizzed across the visitors' goal. only to be missed or ignored by the Brechin forwards. Two points squandered by City, I feel. The players enter from somewhere between the stand and this low lying hut. and the privilege of pressing a hand into setting concrete. The video chaps shoot from this vantage point. 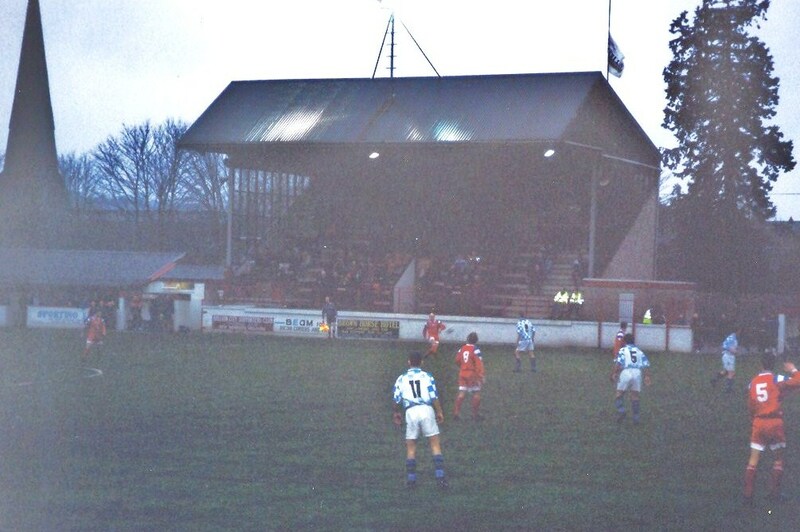 The David Will Stand - Glebe Park, Brechin. I really must visit Glebe Park when The Hedge has its green strip on. 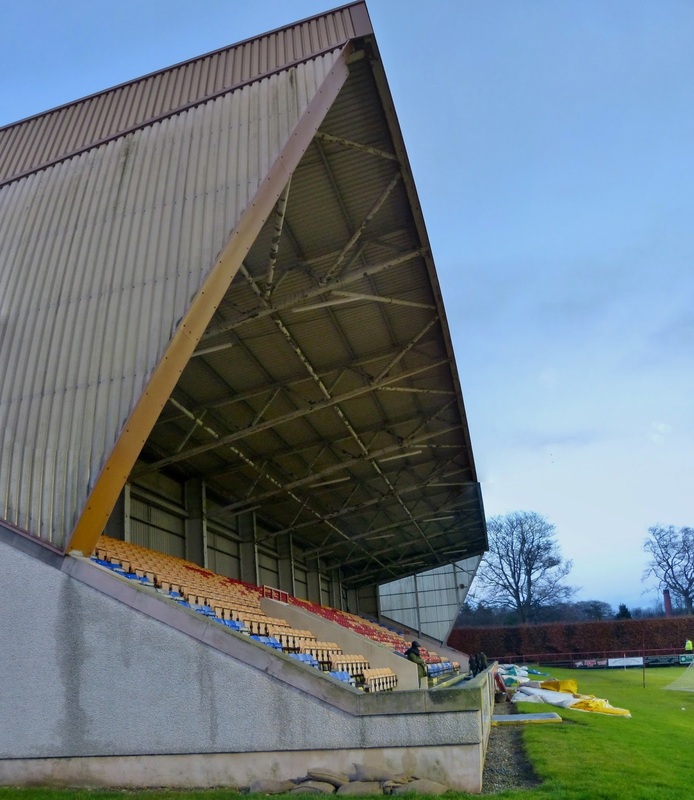 Panorama of Glebe Park, Brechin. I think this is Brechin's Dougie Hill on the ball. bellowing unintelligible gibberish and expletives throughout proceedings. Perhaps he felt it helped his teammates concentrate. The pitch truly was as cut-up as this pic suggests. No criticism of Brechin FC intended - indeed I was delighted a match was played at all. Willis Alves Furtado wonder when he will next see the ball. but he was ably marshalled by the quietly impressive Paul McLean. Brechin's Andy Jackson and Warriors' 'keeper David Crawford share a joke. This was not at full time, but followed a bit of (ahem) simulation by Crawford. is employed to keep the Glebe Park mouse population under control.